Article discusses Tax Treatment under GST Regime of advances received for future supplies of Goods and Services and includes Tax Treatment under GST for advances received but refunded, Tax Treatment under GST for advances received but forfeited, or Tax Treatment under GST for advances received but adjusted for later supplies. Article also discusses GST on advance received by Composition dealer. As per the explanation 1 to Section 12 of the CGST Act, 2017 a “supply” shall be deemed to have been made to the extent it is covered by the invoice or, as the case may be, the payment. For instance, an advance of Rs. 10 lacs is received for a supply worth Rs. 1 crore to be made in future. The time of supply to the extent of advance received i.e. Rs.10 lacs shall be at the time of receipt of advance and for the balance amount of Rs. 90 lacs, it shall be determined with reference to date of issue of invoice and other parameters. k) signature or digital signature of the supplier or his au-thorised representative. What if the rate of tax or place of supply is not determinable at the time of receiving advance payment? 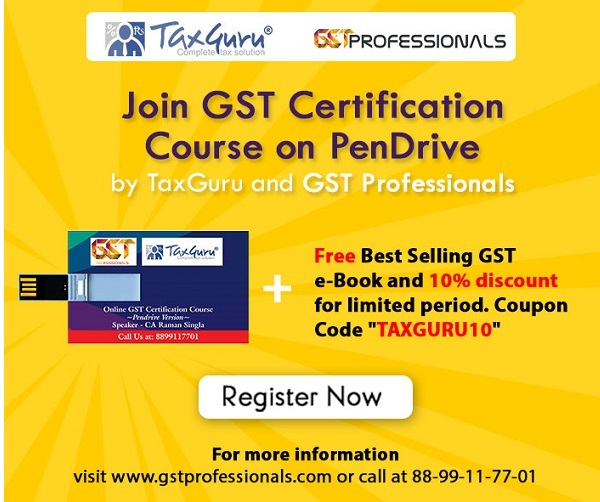 The proviso to Rule 50 of the Rules ibid provides that where at the time of receipt of advance, if the rate of tax is not determinable, the tax shall be paid at the rate of 18% and if the nature of supply is not determinable, the same shall be treated as inter-State supply and GST should be paid accordingly. Once an advance payment has been made and a receipt voucher has also been issued, there may be situations wherein the supply is subsequently not made and the amount of advance is to be refunded back. There could be multiple situations. One is that no tax invoice is issued till then. In that case, the advance taken can be refunded and a refund voucher need to be issued in such cases. However, if tax invoice has already been issued, credit note will have to be issued in order to square off the transaction. Credit Note can be issued in terms of the provisions contained in Section 34 of the Act ibid read with Rule 54 of the Rules ibid. j) signature or digital signature of the supplier or his au-thorised representative. (b) two and a half per cent of the turnover in State or turnover in Union territory in case of persons engaged in making supplies referred to in clause (b) of paragraph 6 of Schedule II, andsubject to such conditions and restrictions as may be prescribed. The provisions of Section 10 are subject to Section 9(3) & (4) which would mean that the composition dealer will have make necessary compliances on account of reverse charge supplies (apart from payment of tax u/s 10 at the prescribed rate on his outward supplies). It may, however, be noted that provisions of Section 9(4) of the Act ibid has been suspended till 31.03.2018 vide Notification no.38/2017-Central Tax (Rate) dated 13.10.2017.Section 10 of the Act ibid also suggests that a composition dealer has to pay, in lieu of tax payable by him, an amount calculated at the prescribed rate. The prescribed rate is applied on the turnover in the state of the composition dealer. Turnover in a state has been defined in Section 2(112) of the Act ibid as “turnover in State” or “turnover in Union territory” means the aggregate value of all taxable supplies (excluding the value of inward supplies on which tax is payable by a person on reverse charge basis) and exempt supplies made within a State or Union territory by a taxable person, exports of goods or services or both and inter-State supplies of goods or services or both made from the State or Union territory by the said taxable person but excludes central tax, State tax, Union territory. Tax liability on advance receipt only for those who is required to issue Tax Invoice not for Bill of Suppply.